A 17-year old man presented with an asymptomatic right testicular mass. 1: Wall of the cyst without adnexal structures and lumen filled with keratin. 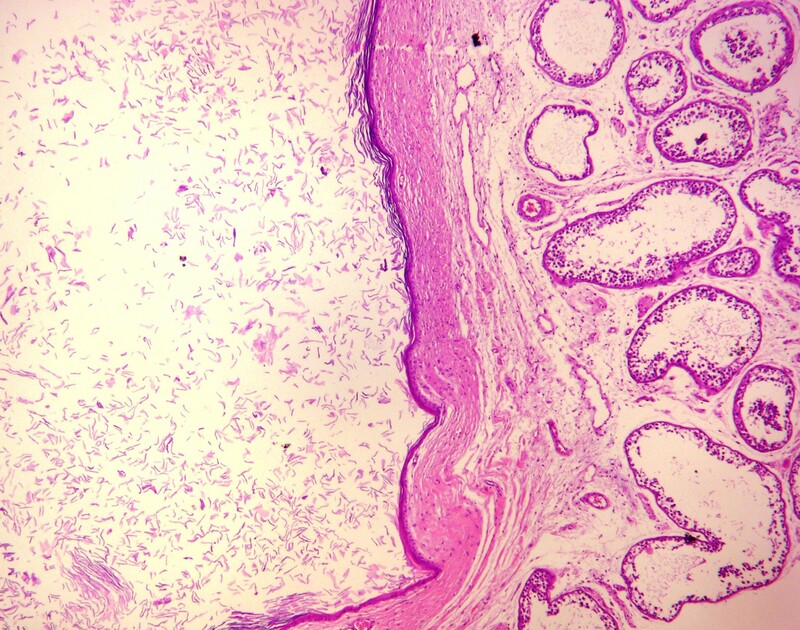 2: Cyst lined by stratified squamous epithelium and surrounded by fibrous tissue. 3: Cyst and adjacent seminiferous tubules. A 1.4 cm cyst, product of testis-preserving surgery was examined. The cyst wall was approximately 1 mm thick, composed of dense fibrous connective tissue, but without skin adnexal structures. It contained atrophic seminiferous tubules and occasional micro-calcifications. The internal surface was lined by thin, stratified, keratinizing, squamous epithelium and the lumen filled with concentric laminated keratin. The cyst was surrounded by testicular parenchyma composed of atrophic, non-neoplastic seminiferous tubules. Epidermoid cysts of the testis constitute approximately 1% of testicular masses. They are usually single, occur more frequently (80%) between the second and fourth decade of life, have a mean diameter of 2 cm, have no preference for side and are randomly distributed throughout the testis. 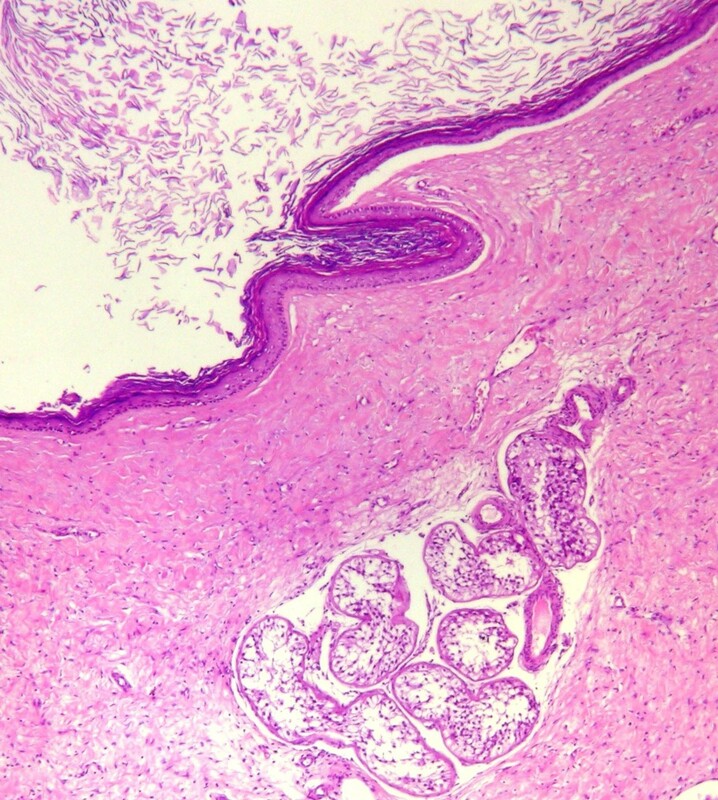 The exact histogenesis is not known, but a monophasic teratoma is favored by most authors. Traditionally, testicular tumours have been treated by orchiectomy, irrespectively of their nature. One of the objectives of presenting this case is to make the point that, since epidermoid cysts of testis are benign lesions and occur primarily in young men, efforts should be made to perform testis-preserving surgery, especially when clinical, radiological and intra-operative characteristics justify it. The intra-operative consultation findings can complete the decision to perform a cystectomy. Since the gross appearance of these cysts is similar to that of epidermal cysts of the skin, the diagnosis should represent no challenge. 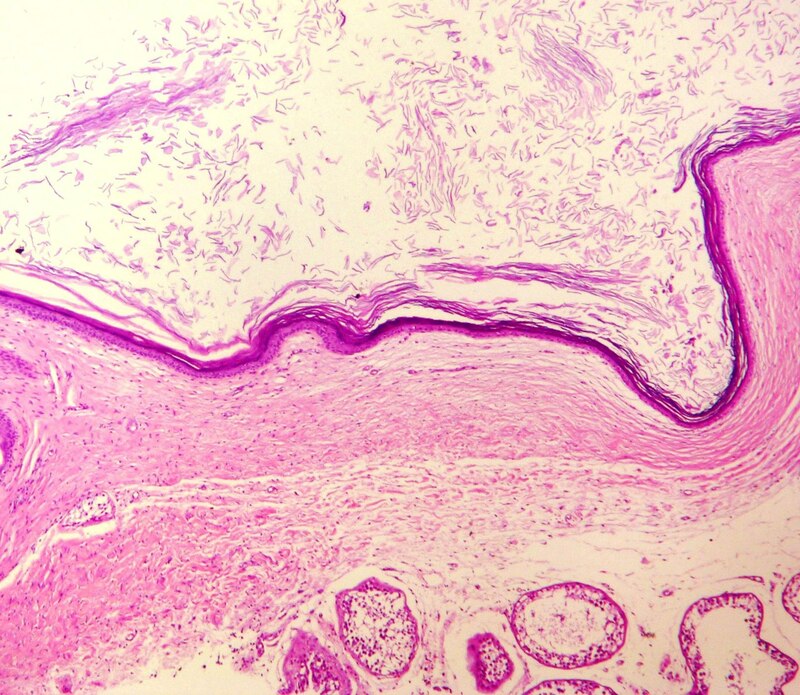 The important role for the pathologist is to microscopically confirm the absence of skin adnexal structures and of intra-tubular germ cell neoplasia. Dr. Roberto Orozco and Dr. Mario Roberto Morales Ruiz, Herrera Llerandi Hospital, Guatemala, Central America.